ShukerNature: A FEATHERED MYSTERY FROM NEW ZEALAND...MOA OR LESS! A FEATHERED MYSTERY FROM NEW ZEALAND...MOA OR LESS! Megalapteryx - does it still survive today? "I read a book once about this guy who went on an expedition to find proof of the Yeti in the Himalayan Mountains. After two years there he left without a sighting or anything. But when people pointed this out to him he shrugged and said ‘In two years I never saw a Snow Leopard either and we know they exist’. Maybe that’s the same with your Moa. Maybe they were just too good at hiding. If they had survived to present day they must be fairly good at keeping out of sight." "Among reported direct observations by Europeans, one of the most arresting is that given in her later years by a Mrs Alice McKenzie who was born and spent her childhood at Martins Bay. Throughout her life she retained a vivid recollection of an incident when, as a child of seven, about the year 1880, she had been waiting for her brother who was mustering cattle. As she sat on a coastal sand dune adjacent to forest, she was surprised to see a large bird of dark bluish plumage standing close to her. It was about 3.5 feet in height, and her clearest recollection was of its large protruding eyes, broad beak, and powerful scaly legs which she remembered as being about the same thickness as her own forearm and wrist. After she had published this description in a book of reminiscences, Mrs McKenzie was cross-questioned by many people and interviewed for radio broadcast. She continued to give convincing and good descriptive answers." A few years later, I read Dr Bernard Heuvelmans’s classic book On the Track of Unknown Animals (1958), which contained an entire chapter on the subject of putative surviving moas, but I was surprised and disappointed that this did not mention McKenzie’s famous sighting. Notwithstanding that strange omission, my own interest in her account has always remained keen, and finally, in my book Extraordinary Animals Revisited (2007), I documented it myself, by which time various intriguing new developments had taken place. “In New Zealand, there seems little hope that any of the famous ostrich-like moas of the genus Dinornis (‘terrible bird’) still survive, but it may even now be premature to claim the same for at least one of their less familiar, smaller relatives. Apparently an inhabitant primarily of subalpine shrubland and montane forests, the upland moa Megalapteryx didinus is not generally assumed to have survived beyond the 1840s; indeed, some consider that even this extinction date is too recent. “One of the most thought-provoking reports casting doubt upon such claims, however, is contained within the 1952, revised edition of Alice McKenzie’s book Pioneers of Martins Bay (first published 1947, but lacking this report). In it, she recalled her encounter in 1880 as a 7-year-old child at Martins Bay, South Island, with a strange bird that cannot be conclusively identified with any known species alive today. Able to walk straight up to it, she described it as a large bird at least 3 ft high, with navy-blue plumage, dark green legs with large scales, no noticeable tail, and three large claws on each foot. She endeavoured to capture it, and in response it attempted to attack her, so she ran home. When she returned to the spot with her father, the bird was gone, but its three-toed tracks remained. Using a measuring ruler, her father found that the middle toe measured 11 in from heel to tip, though the soft sand may have enlarged it a little. “In 1889, she saw the bird again, and her brother spotted it once too. 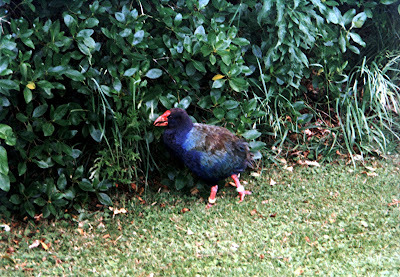 After the rediscovery in December 1948 of another supposedly extinct South Island bird, the famous flightless rail known as the takahe Porphyrio (=Notornis) mantelli, Alice McKenzie examined a preserved specimen, because its dark blue plumage suggested the possibility that the mystery bird she and her brother had seen had been a takahe. Indeed, in 1946 (two years before the takahe’s rediscovery), she had written to an Otago University professor actually claiming to have seen a takahe. After examining one, however, she then discounted this possibility, stating that the takahe seemed totally different in appearance from the mystery bird that she had seen in 1880 and 1889, noting in particular that the takahe’s legs were deep red, not green like her bird’s. Could Alice McKenzie’s mystery bird have been a living Megalapteryx? Some ornithologists are optimistic that it was, but others consider it to have been a takahe after all, or even, as proposed in 1987 by New Zealand author John Hall-Jones, a blue-plumaged white-faced heron. “Alice McKenzie died in 1963, but now, 44 years later [i.e. in 2007], her granddaughter, Alice Margaret Leaker, who is convinced of the veracity of her maternal grandmother’s testimony, has compiled a new edition of her book, in which she delves deeper into this longstanding controversy. Quite apart from the late date of the sighting, however, another problem when attempting to reconcile McKenzie’s bird with a moa is that none of the numerous moa remains so far recovered have included any blue-coloured feathers. “During February and March 1978, yet another in a long line of modern-day moa hunts took place. Led by biologist Prof. Shoichi Hollie of Japan’s Gunma University and accompanied by Seido Hino (Director of Japan’s Nippon Television), a Japanese team of scientists converged upon South Island’s Fjordland, armed with a very sophisticated lure — a reconstituted moa cry on tape, created with the aid of computerised analyses of Megalapteryx throat structure using fossil remains. Tragically, however, as Prof. Hollie subsequently informed me, it failed to elicit any reply, and he now considers Megalapteryx to be extinct. This is also the opinion of Ron Scarlett, the Canterbury Museum osteologist with whom the team consulted upon arrival in New Zealand. “Much of the Megalapteryx mystique and the continuing hope that it will eventually be discovered alive stems from another avian mystery. 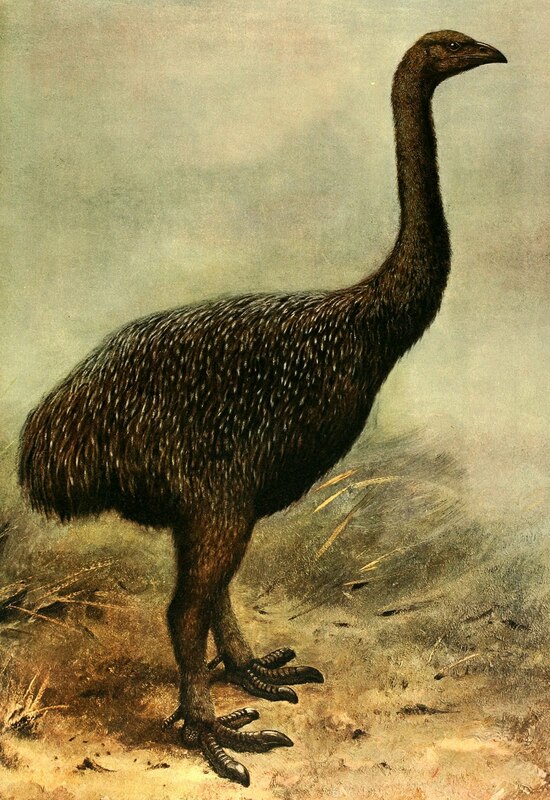 According to Dr Bernard Heuvelmans in On the Track of Unknown Animals (1958), the Maoris tell of an unidentified form of ‘giant kiwi’, termed the roa-roa, said to be the size of a turkey, and armed with sharp spurs on its feet. However, as I discovered from Ron Scarlett and from a number of works dealing with New Zealand’s avifauna, roa-roa is actually the name given to the largest of the known kiwis, i.e. the great-spotted kiwi Apteryx haasti of South Island. Another name for this mysterious, unidentified ‘giant kiwi’ was the fireman – given to it by sealers from Foveaux Strait who often spent many months in South Island’s south-western fjords, living off the land. When some were questioned by Frederick Strange, a naturalist accompanying HMS ‘Acheron’ on survey there in 1852, they informed him that the reason why they called this bird the fireman was that its cry sounded like the noise made by the wooden rattle carried in those days by New Zealand firemen on duty. Rather than attempting to lure into view a living Megalapteryx using a sophisticated computer-reconstituted version of its cry, perhaps, therefore, Prof. Shoichi’s team should have simply used one of these rattles! Frederick Strange left the HMS Acheron in Sydney on 1 November 1849 and was not on the vessel when it visited the southern sounds in 1851. This is discussed in Moa Sightings, chapter 2 (available from www.moasightings.com). Moa feathers have been described as being "a dark reddish or chestnut purple," "dark purple brown," "nearly black," "black or dark colour, with a purple edge," and "shades off into black." (Moa sightings, chapter 22). Several further accounts of moa sighting claims have been made since Alice McKenzie's sightings, including from helicopters and by hunters. Over 100 claims are examined in the book Moa Sightings. Hi Bruce, Your allegation that Strange did not visit the southern sounds in 1851 on Acheron is interesting, because it directly contradicts the statement of emineent New Zealand ornithologist Dr Robert A. Falla, who wrote the following in A New Dictionary of Birds: "Sealers from Foveaux Strait were in the habit of spending many months in the south-western fiords and living ofF the land. They seldom had occasion to report natural history observations, but when some of them were questioned by F. Strange, a naturalist who accompanied H.M.S. `Acheron' on survey in 1852, they described various birds upon which they depended for food. Most of the birds described are recognisable, except one referred to as a large bird and called by the sealers `the fireman'. The reference here was to a rattling call reminiscent of the sound made by the wooden rattles carried by firemen on duty." So are you saying that Falla is incorrect? Thank you for your note. In my view Dr Falla was incorrect in stating that Frederick Strange was on the HMS Acheron on survey in 1852. Strange left Sydney for New Zealand on 30 October 1848 on the HMS Acheron under the command of Captain Lort Stokes (Whittell HM. Frederick Strange: a biography. Australian Zoologist 1947;11(2):96-114. He undertook a trip from 4 March 1849 to 10 March 1849 64 miles inland from Port Cooper. The HMS Acheron then charted the east coast of Otago before going north to chart the coasts of Cook Strait during May 1849. In October 1849 the ship was ordered back to Sydney for repairs (Natusch S. The cruise of the Acheron: Her Majesty's steam vessel on survey in New Zealand waters 1848-51. Christchurch: Whitcoulls Publishers; 1978. p 139). The Sydney Morning Herald of 2 November 1849 noted that the HMS Acheron arrived back in Sydney with "two living kiwis on board (Strange F. Port Cooper (New Zealand). Narrative of a trip sixty-four miles to the west of Port Cooper, 4-10 March 1849: a naturalist's observations of a trip across the Canterbury Plains. Sydney Morning Herald (Suppl). 1850 Jan 26. Reprinted in the New Zealand Journal 1850 and in a pamphlet entitled Library notices of the late Frederick Strange, naturalist. In January 1850 the HMS Acheron sailed again for Auckland but Frederick Strange did not return with it and was not present when the Acheron visited Ruapuke in Foveaux Strait in 1850 or Preservation Inlet or Milford Haven (Milford Sound) in 1851 (Natusch 1978. p.140-7, 154-8). Strange left Sydney in March 1852 and returned to England for a few months. An article in the London Morning Advertiser on 24 June 1852 gave some publicity to his arrival (Sydney Morning Herald. Suppl. 1850 Jan 26). Strange was killed with three others in a massacre at the Second Percy Island on 15 October 1854 (Datta A. John Gould in Australia: letters and drawings. Carlton South (Australia0: Miegunah Press, Melbourne University Press; 1997. p. 458). I have discussed the matter further in Chapter 2 of Moa Sightings. In my view, the evidence indicates that Strange was not on the HMS Acheron when it visited the south-western fiords of New Zealand and that in this detail Dr Falla was incorrect. No, nothing further emerged re this investigation, and the sighting is nowadays largely dismissed as having featured a red deer (a non-native species introduced into New Zealand over a century ago and now very common there). You're joking. Dinornus? King of the moas? THE Dinornus?!? I don't believe it. I just do not believe a word! I have always dreamed of the possibility, ever since I first saw the skeleton of a moa at the museum. Sorry if I'm getting excited. Maybe I'm inheriting some, er, mental conditions from poor Uncle Irwin. This blog always has something good. Ever since I found ShukerNature, I have logged on every day to escape the hubub of modern life. It's my favourite place in the world, full of tales about unicorns and ooh-aah birds, hunts for trunko and littlefoot, legends of hermanubis and the pooka, a world of oddities and extraordinary truths, new species and the legacy of Heuvelmans! Were still on the track of unknown animals, and I have loved the whole ride. I should have known that there would be something moa-related here, because they're my favourite bird and everything I like is on this blog. You are the next Heuvelmans. Keep on the trail, and for cryptids everywhere, watch out because the ultimate cryptozoologist is after you! Bigfoot, nessie and yetis galore, look out! Thanks for your kind words re my blog and myself - very glad to hear how much you enjoy ShukerNature!! Re moas, I don't think that any of the big, Dinornis moas still exist, sadly; but as for the much smaller Megalapteryx? In the dense, remote forests of Fjordland, there may still, just, be a small possibility - who knows? I think that there is a pretty good chance of the megalypterix surviving. I mean, New Zealand hid the takahe and the kakapo for years. It could just as easily conceal our fine feathered friend, the "fireman"! But as for Dinornus and Aepyornis, the situation is bleak. Aepyornis was an elephant bird from Madagascar. Don't worry, it's an easy mistake. I embarrassingly called Megalypteryx an elephant bird on one blog! Re on moas. Did that hotel owner send out the expedition to hunt for the moa? I hope he finds it. We really shouldn't give up hope - after all, the Vu Kuang Ox hid for an impressive amount of time in an easily accessible national park! On Megalypteryx, I think the chances are exciting. It is a relatively small bird, as big as a takahe, and the takahe appeared, disappeared, hid, cheated extinction and eluded us for a century. Maybe megalypteryx could do the same thing! The link to my name has one of the plates (pl. 59) that accompanied the report on the Megalapteryx from "Transactions of the Zoological Society of London," Vol. XI. The Megalapteryx is remarkable in that the specimen from which the type was based does include feathered remains. The picture of the plate suggests that the skin of the head was also intact, but this is only what was applied to mummify it. For some reason ornithologists are set on excluding Megalapteryx from the lists of recent birds on this account, even though some species (Pezophaps, Prosobonia ellisi) included in world lists are only based only on skeletal material or drawings. The reason to exclude M. has to do with the argument that, though some feathers were retained, they are incredibly old and would otherwise be subfossil. Karl, I personally still hold some hope that in the dense forests of Fiordland there may still be hope for some of the medium to small species, with a faint possibility that perhaps few Dinornis giganteus still survive. Even to this day. What made me consider that possibility is that there are still species of moose that were released, had never been heard from again for seen and yet DNA proof in a very old photo proven they still exist in this largely unexplored region, where even the early Maori were cautious of going. To this day, Fiordland remains greatly unexplored, and any area that can hide something as large as a moose would surely have no problem in concealing. At least one species of Moas that existed in New Zealand. Personally, I am not ready yet to write the Moa too quickly and to the extinction record as I feel in the future something may turn up that even as the sun sets in the Hawke's Bay and upright creature prepares to walk its long trodden path to its den in the dense Fiordland Bush. I know it sounds selfish in many ways but I certainly do not hope that we find these elusive creatures. Like most of these creatures, we would only lead to their destruction..
That is an interesting account. Do you know the seamans name?